Simple Comfort Food - Page 3 of 220 - Recipes that are simple and delicious. I’m late to this game. The game of sous-vide, the method of cooking in which food is placed in a plastic, vacuum sealed bag which is cooked in a water bath for longer than normal cooking times at an accurately regulated temperature. You see the process on cooking shows, etc. Typically a piece of meat or vegetable is placed inside a bag along with herbs or oil marinade, sealed, and placed inside the ‘jacuzzi’ to cook. I wanted one many years ago but decided to hold off until they would hopefully come down in price. Well, I folded because the price was right on a brand, Anova, and gosh am I glad that I did! My first reaction was to cook a nice cut of beef at a perfect temperature but we had already feasted on a beef dinner around the holidays, with plenty of leftovers, so I decided the next would be thick cut pork chops. I’ll admit that I love overcooked, almost dry, pork chops especially the thin cut style over charcoal but I’m not going that direction. These I knew would be perfect (well at least I was hopeful), juicy, and delicious, and hopefully worth the deal on the precision cooker. First off, the Anova is way too easy to use. I initially thought that this might get complicated, and granted you should be able to vacuum seal with something like a FoodSaver or use this simple technique, but the rest is simply plugging it in, setting a temperature, and a time. Simple, and a bit too easy in my book. Kidding. Start by seasoning each side of the pork chops with salt and pepper. Place inside of your sealable bag and add the olive oil and pork chops. You can seal a chop per bag, or spread out two, so as long as they will fit in your cooking vessel. Vacuum seal, or squeeze out as much air as humanely possible. Add water to your vessel, in my case I simply used a pressure cooker pot but you can use any large pot. Fill enough water to submerge your precision cooker. There is basically a fill line marked on the Anova device. Set your temperature. I did 140F degrees at 2 hours. Once you plug the device in and set the time and temp, it regulates the water temperature and circulates the water. Make sure the sealed bags are submerged completely. 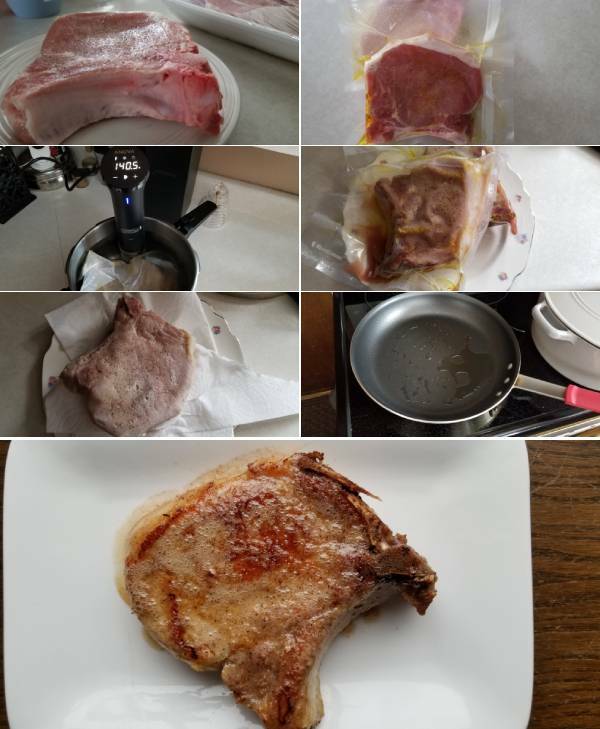 After two hours (go about your business), or more (I say more because this keeps your temperature at 140 degrees until you remove it from the expired time), carefully remove the bags from the hot water, cut them open, and place the pork chops onto paper towels to remove any moisture. Don’t worry. These are not that pretty when you remove them from the bag. The next step is where ‘real pretty’ comes into play. Keep in mind the pork is done at this time, and as indicated in the Anova manual, they should be cooked at 140 degrees from edge to edge. Heat a large skillet on medium-high heat. Let this heat up for a couple of minutes until it begins to lightly smoke. Toss in all of the butter, and the herbs if using, then lay in the pork chops, ensuring they are patted dry before placing. Your goal is to get them nicely seared. Gently tilt your pan, and using a spoon begin collecting the butter and pouring it over the pork chops. Repeat this process over the course of the next few minutes, turning the chops over and continuing with the butter. Remove them from the skillet after your desired browning. Keep in mind you can finish these on a hot grill as well for a couple of minutes per side for the grill marks and smoky flavor. Plate, and drizzle the brown butter over the top if you desire. Season with a touch of salt, and get excited. I called my kids to the table, along with my wife, and I will admit that I was excited. Not only because they looked pretty darn good at this point, but I was anxious to see if they would be the temperature they were and how juicy they would be. I took the internal temp with my digital thermometer and they measure at 146 degrees. What some may seem as medium for pork, trust me, this was perfect. No lie, this was probably the most moist, tender, and delicious pork chop not only that I have ever made, but also that I have ever had. After my son and I finished the pork chop we both were kind of giddy with delight. If you are like me and have always been on the fence with precision cooking, get off and get to it! I have more to follow including fish, vegetables, chicken, and yes… beef. Do you have one of these devices and do you enjoy cooking with it? Please don’t get bored with me. I know I am posting more and more cookie recipes that I recently made, but it is the season, and I promise I will have much more comforting food recipes to please your eyes and palettes in 2019. Do you know how many recipes I posted in 2018? Me neither, but I know it is quite a bit and that is a bit surprising with all of the stuff we have been dealing with this year, and I am thankful to be able to keep posting. Hopefully one day my kids will look into my website and make a recipe or two. That’s a goal. 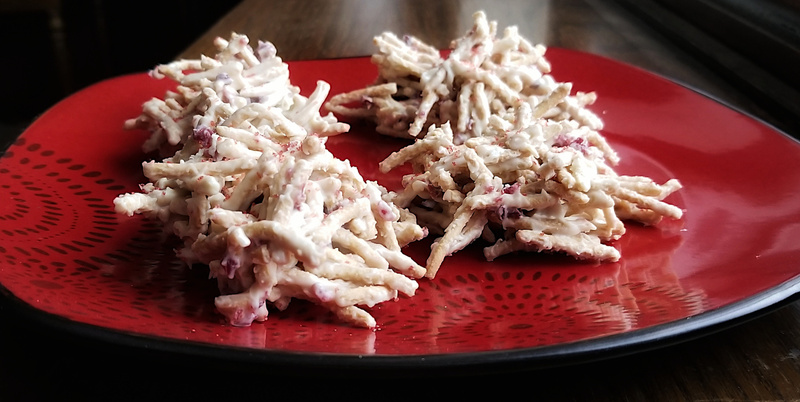 So with the cookies that I have made, these white chocolate and cranberry haystacks were a real treat and something my wife and kids could not stop eating. Who knew chow mein noodles could be so delicious, right?! This is another one of those cookies that are basically melt, form, and eat. A no baker type of cookie. Place your chow mein noodles in a mixing bowl. Toss in the ground up cranberries. Melt your white chocolate. I do these over a double boiler but you can keep an eye on it in the microwave, stirring frequently up to 3 minutes. The goal is to get nice and creamy white chocolate. Have I told you I was never a fan of white chocolate, up until recently? Crazy how that works. Once the chocolate is melted, pour into the bowl of noodles. Stir, and stir quickly coating all of the cranberries and noodles. Notice on the image above with the Chow Mein. The callout says ‘Improved Taste!’. Yikes. Hey, at least there is 0g of trans fat per serving. Next, line a baking sheet with parchment paper. Take two spoons and form into bite sized shapes. These will be all over the place in terms of size and shape, so don’t worry! Sprinkle with sprinkles if you want. Let these sit in a cool place, uncovered for about 1 hour, or less until the chocolate hardens and you are left with the haystacks. Take one. Just try and take ONE. Now watch others eat them as you eat them. These things are great, and fun. 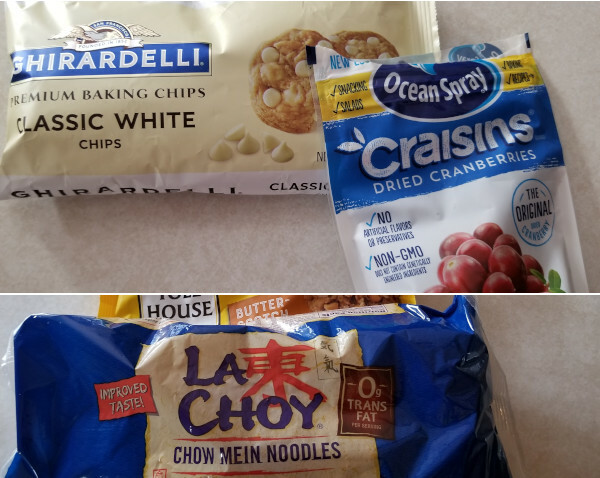 They somewhat shatter and the crunch of the chow mein, along with the sweetness from the white chocolate pairs so well with the subtle tartness from the cranberries. Now, only about 15 more cookie recipes to post… Kidding. Enjoy!